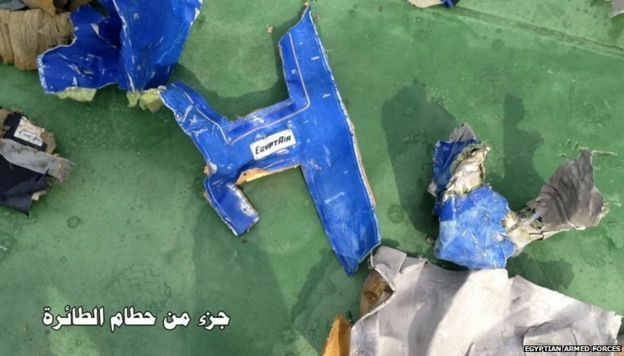 EgyptAir flight MS804: What we know? The EgyptAir Airbus A320 flying overnight from Paris to Cairo crashed into the eastern Mediterranean Sea early on Thursday 19 May. Flight MS804 had 66 passengers and crew on board. 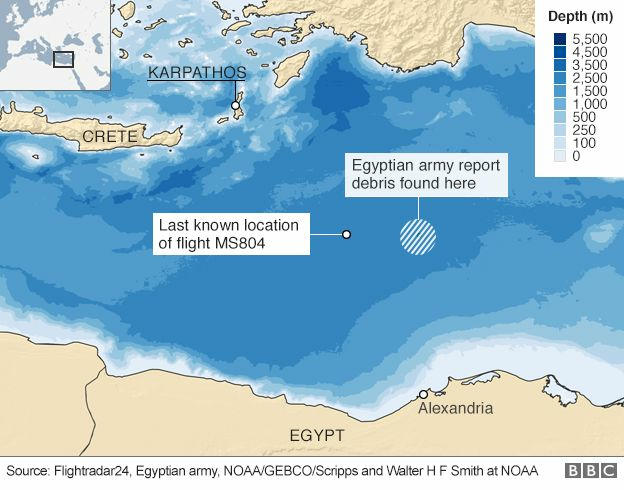 Debris from the crashed flight has been recovered in the Mediterranean, 290km (180 miles) north of the city of Alexandria in Egypt. Flight MS804 left Paris Charles de Gaulle Airport at 21:09 GMT (23:09 Paris time) on Wednesday. It was scheduled to land at Cairo International Airport at 01:15 GMT (03:15 Cairo time). At 23:24 GMT (02:24 Athens time), the plane entered Greek airspace. Greek air traffic controllers spoke to the pilot at 23:48 GMT as the plane flew over the island of Kea. He was in good spirits and reported no problems. 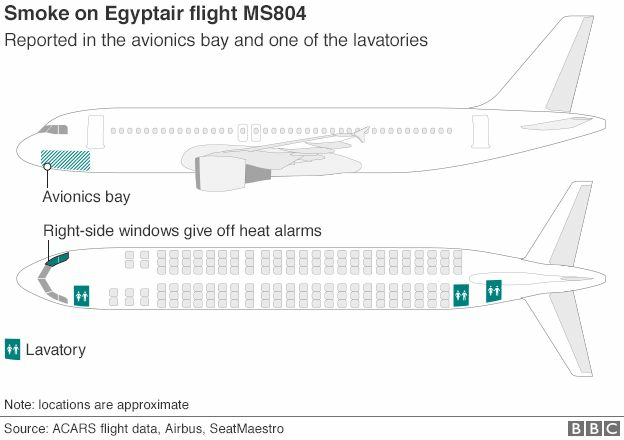 At 00:26 GMT smoke was detected in the toilet, according to data sent back to the airline via the ACARS reporting system. At 00:27 GMT,more smoke was detected in the avionics area which contains the aircraft’s electronics and computers below the cockpit. The controllers tried to make contact with the plane at 00:27 GMT, before it left Greek airspace, but despite repeated calls, the aircraft did not respond. At 00:29 GMT, the aircraft left Greek airspace and at 00:29.40 GMT it vanished from Greek radar. At some point before the aircraft was lost from radar, it turned 90 degrees left and then 360 degrees to the right, dropping from 37,000 [11,300m] to 15,000ft [4,600m] and then 10,000ft [3,000m], according to Greek investigators. 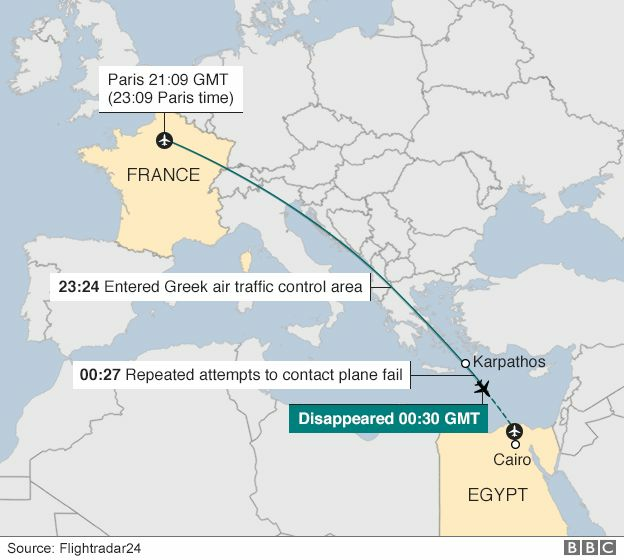 The plane lost contact with Egyptian radar at 00:30 GMT (02:30 Cairo time), when it was 280km (174 miles) from the Egyptian coast. Search and rescue operations began at 00:45 GMT. The area in which flight MS804 crashed is one of the deepest in the Mediterranean – more than 3,000m (10,000ft) in some parts. Floating debris has been found to the east of the plane’s last known location. Egypt’s military has released images of wreckage including a lifejacket, pieces of material and metal fragments. The search is now focused on finding the plane’s so-called black box flight data and voice recorders. This could take up to a month, experts say, as ridges in the ocean floor could block signals from the flight recorders and also interfere with sonar from vessels searching for the wreckage. The fire alarm data could be the biggest clue yet as to what happened. It suggests there was a fire at the front of the aircraft, on the right-hand side, and that the fire spread very quickly. Egypt’s civil aviation minister said the possibility of a terrorist attack bringing down the aircraft was “stronger” than technical failure. Last October, an Airbus A321 operated by Russia’s Metrojet was brought down by a bomb over Egypt’s Sinai peninsula, killing all 224 people on board. A local affiliate of the jihadist militant group Islamic State (IS), called Sinai Province, said it had smuggled a device on board. However, Egyptian Prime Minister Sharif Ismail has been reluctant to speculate over the cause of the disappearance. “We cannot exclude anything at this time or confirm anything,” he told reporters. After last November’s Paris attacks, some airport staff had their security clearance revoked over fears of links to Islamic extremists. Bad weather is not thought to be a contributing factor – the European Organisation for the Safety of Air Navigation said the weather was clear at the time the plane disappeared. There were 56 passengers, seven crew members and three security personnel on board. The passengers comprised 30 Egyptians, 15 French, two Iraqis, one Briton, one Kuwaiti, one Saudi, one Sudanese, one Chadian, one Portuguese, one Belgian, one Algerian and one Canadian. 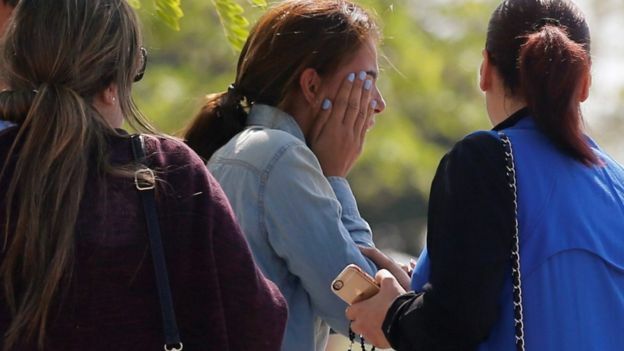 Three of the passengers were children, two of them infants, EgyptAir said. Egypt’s state-run al-Ahram newspaper identified the pilot as Captain Mohamed Shokeir. EgyptAir said he had had 6,275 hours of flying experience, including 2,101 hours on the A320, while the first officer had had 2,766 hours. An Egyptair official identified the co-pilot as Mohamed Assem, with more than 2,000 hours flying experience. What do we know about the plane itself? Airbus said the aircraft involved, an A320-232 registered as SU-GCC, was delivered to EgyptAir from the production line in November 2003. The twin-engine aircraft had accumulated approximately 48,000 flight hours. 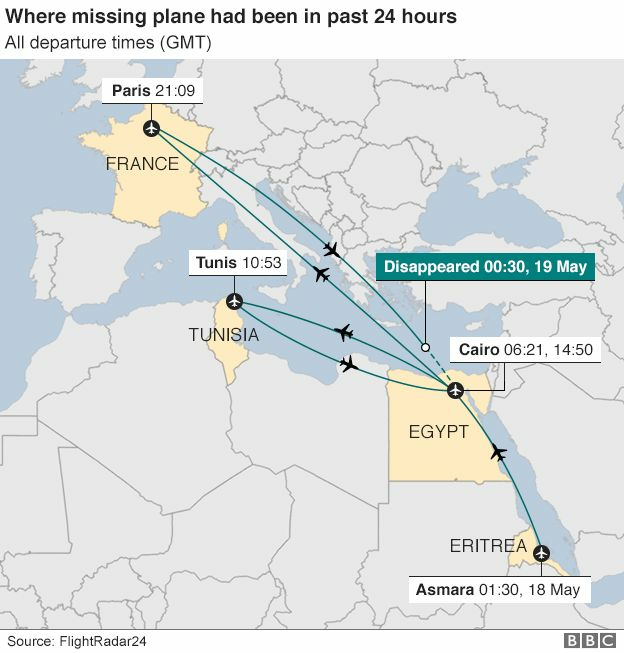 The plane tracking website, Flightradar24, reported that on Wednesday the plane had flown from Asmara, in Eritrea, to Cairo, then on to Tunis, in Tunisia, before heading, via Cairo, to Paris. The BBC has learned that the plane that disappeared was forced to make an emergency landing in 2013 after the pilot noticed the engine overheating, but an official report said the defect had been repaired. A320s typically seat 150 passengers in a two-class cabin, or up to 180 in a high-density layout. They have a range of up to 6,480km (3,500 nautical miles). The aircraft family first entered service in 1988. At the end of April 2016 more than 6,700 A320s were in operation worldwide, according to Airbus. To date, the entire fleet has accumulated almost 180 million flight hours in over 98 million flights. Are plane crashes happening more frequently? No. Despite several high-profile plane crashes in recent years, data gathered by the Aviation Safety Network (ASN) shows that 2015 had a record low total of 16 fatal airliner accidents, resulting in 560 fatalities. Our condolences and prayers go out to all the families, relatives, friends of the Egyptian flight passengers and to all the Egyptians. The Egyptian American Chamber of Commerce knows that the Condolences are not enough and we have got to do a lot of meaningful acts to address this crisis. We trust the Egyptian president Abd El Fatah El Sissi & the whole Egyptian Government that they will react in the most proper way and we will support their statements and actions. We ask all the Egyptians sending-out speeches and statements; It is not the right time for political fights, please remember that we are Egyptians and we always meant with the human sides. So, kindly send out your prayers to the passengers who died in this crisis and your support to their families who are suffering in such critical situation. On April 21, 2016 Egyptian American Chamber of Commerce represented by Chairman Nagui Guorgui attended the event held by the Egyptian Consulate and H.E. Ambassador Lamia Mekhemar Consul General of Egypt in Los Angeles where H.E. Nabila Makram, Minister of State for Immigration and Egyptian Expatriates met Egyptian American community in Southern California. Stay connected to EACHAM and join our news for the future meetings gathering the Egyptians abroad with the Egyptian officials and delegates. One of the good news, the Egyptian National banks are providing a very good opportunity for Egyptians living abroad to invest in the BELADI saving Certificates with interest up to 5.5% yearly on the USD. For more information on the Certificates or the business opportunities in Egypt, you can contact the Egyptian American Chamber of Commerce or AL AHLY Bank in New York. EACHAM had a very successful exposure along with the members who participated in the WBOC. Special Thanks to Marie Ghanime and Monique Ray who took care of preparing and harmonizing everything related to EACHM participation. Our wishes for good results and thanks to our members & sponsors who participated with the EACHAM in this event: Stylish Tours, Promotion Team, Sashay World, Barbara Ruben, Nilofar Fashion, Marketing For Travel, SG Enterprises.